Osteoarthritis (OA) is the most prevalent disease of the articulating joints associated with extracellular matrix degradation and is characterized by pain, tenderness, movement limitation, crepitus, and a variable degree of inflammation without systemic effects (1). The pathogenesis of OA is complicated and involves different factors ranging from genetic predisposition to altered mechanical stress and changes in the gene expression repertoire of the articular chondrocytes (2). The highly regulated balance of matrix synthesis and degradation is disrupted in OA, leading to progressive breakdown of articular cartilage. The molecular events and pathways involved in this progressive loss of articular cartilage and chondrocyte disfunction in OA are not fully understood. Chondrocytes are the sole producers of cartilage extracellular matrix synthesis. Proteolytic degradation of cartilage is a hallmark of OA, and activated chondrocytes can produce matrix-degrading enzymes such as matrix metalloproteinase 13 (MMP13, also known as collagenase 3) in OA joints (3). 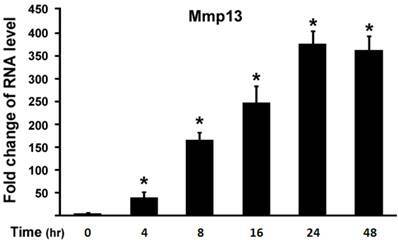 Mmp13 is able to cleave types I, II, III, IV, X, and XIV collagen, aggrecan, with the highest activity to type II collagen (4). Presence of MMP13 expression in the site of cartilage degradation in OA joints provides evidence of its key role in the pathogenesis of OA (5). Clinical observation revealed that MMP13 expression is significantly higher in chondrocytes of OA patients with articular cartilage destruction (6). Moreover, a transgenic mouse model has demonstrated the role of MMP13 in OA in which induced expression of MMP13 resulted in pathologic changes in the joints, similar to human OA (7). Vitamin D as a steroid hormone plays an important role in the maintenance of proper calcium and phosphorus metabolism to ensure that the serum concentration of these ions is optimal for normal mineralization of the collagen matrix. The bioactive form of vitamin D is 1,25-dihydroxyvitamin D3 (1,25-(OH)2D3), which has a recognized role in a variety of bone and mineral disorders such as osteoporosis and rickets. The vitamin D receptor (VDR) is a member of the nuclear hormone receptor superfamily that regulates target gene transcription in response to 1,25-(OH)2D3 (8, 9). 1,25-(OH)2D3 has multiple biological functions including directs mineral homeostasis, protects skeletal integrity, and modulates cell growth and differentiation in a diverse array of tissues (10). It has been reported that 1,25-(OH)2D3 stimulates osteoblast differentiation and the calcified matrix deposition. Conversely, 1,25-(OH)2D3 may stimulate calcium mobilization from the bone by promoting the differentiation of precursor cells into mature osteoclasts. On the other hand, 1,25-(OH)2D3 inhibits chondrocyte proliferation in growth plate cartilage (11). It has been demonstrated that 1,25-(OH)2D3 was synthesized by macrophages derived from the synovial fluid of patients with inflammatory arthritis (12, 13). Interestingly, macrophages themselves possess 1,α-hydroxylase, which is the decisive enzyme responsible for the production of the active metabolite of vitamin D, 1,25-(OH)2D3. One study has demonstrated VDR expression by chondrocytes within osteoarthritic cartilage, particularly near to the articular surface and fibrillations (14). This up-regulation of VDR expression in OA cartilage was also mirrored in the cartilage derived from rheumatoid joints (15). The report that chondrocytes express VDR has suggested a contributory role for 1,25-(OH)2D3 in the aberrant behavior of chondrocytes in OA. However, the physiological function of 1,25-(OH)2D3 on chondrocytes in OA remains obscure. In this study, we explore the effect of 1,25-(OH)2D3 on MMP13 expression in chondrocytes as well as its mechanism. We provide evidence to show for the first time that 1,25-(OH)2D3 activates MMP13 expression through the mitogen-activated protein kinase p38 pathway. ATDC5 chondrocytes (ATCC) were cultured and maintained in DMEM supplemented with 10% fetal bovine serum and 100 units/ml penicillin plus 100 μg/ml streptomycin at 95 % air / 5 % CO2 humidified incubator. Rat chondrosarcoma (RCS) chondrocytes were used and cultured as previously described (16). Chondrocytes were treated with 1,25-(OH)2D3 (Sigma-Aldrich) at the indicated amounts. Specific kinase inhibitors SB203580 and SP600125 were purchased from Sigma-Aldrich, and added as indicated. Total RNA from chondrocytes was isolated directly using an RNeasy Mini Kit according to the manufacturer's protocols (Qiagen). RNA was subjected to quantitative RT-PCR using the TaqMan One-Step RT-PCR Master Mix reagent (Applied Biosystems) as previously described (17). RT-qPCR was performed on a Thermal Cycler (iCycler, Bio-Rad) for 40 cycles at 95 ºC for 15 s and at 48 to 58 ºC, depending on the melting temperatures of the primers, for 30 seconds. Relative transcript levels were measured by real-time PCR in a 50 µl reaction volume on 96-well plates using an ABI PRISM 7000 sequence detection system (Applied Biosystems). Transcript levels were normalized to glyceraldehyde-3-phosphate dehydrogenase (GAPDH) levels. All reactions were done in duplicate and all experiments were repeated at least three times. The relative mRNA expression levels were calculated according to the comparative CT (∆∆CT) method as described by the manufacturer (Applied Biosystems). Target quantity is normalized to endogenous control and relative to a calibrator, and is calculated using formula: Target amount = 2-∆∆CT . Protein was isolated by acetone precipitation from the RNeasy cell lysates according to the manufacturer's protocol (QIAGEN). The protein pellet was dissolved in 1% SDS buffer, warmed for 15 min at 55°C, and centrifuged for 5min at 14000 rpm. Protein concentrations in the supernatant were determined using a BCA Protein Assay Kit (Pierce). Proteins were separated on 10% SDS-PAGE gels and transferred to a PVDF membrane followed by Western blot analysis as previously described (18, 19). Briefly, 3% milk in TBS containing 0.1% Tween-20 was used to block non-specific binding. The blot was subsequently incubated with an anti-MMP13 rabbit polyclonal antibody (1:200, Abcam), an anti-phospho-p38 rabbit polyclonal antibody (1:200, Cell Signaling) or an anti-β-actin rabbit polyclonal antibody (1:2000, Santa Cruz) followed by a secondary antibody (peroxidase-conjugated anti-rabbit IgG 1:2000, Sigma). After each antibody incubation, blots were extensively washed in TBS containing 0.1% Tween-20. For detection, the ECL kit (Amersham Life Sciences) was used according to the directions of the manufacturer. Subcloning was performed as previously described with modifications (8, 20). Briefly, the fragment of the 1kb MMP13 promoter region was generated by PCR using mouse genomic DNA as a template and subcloned into the XhoI and MluI sites of the pGL-3 vector. Primers were obtained from Integrated DNA Technologies (IDT) (Coralville, IA). The primer sequences were as follows: 1) MMP13-Xho-3 5'GCG CCT CGA GTC TCT CCT TCC CAG GGC AAG CAT, 2) MMP13-Mlu-1K 5' GCG CAC GCG TTG ACC ATG GGG CTA GAA AGT. All constructs were verified by DNA sequencing. ATDC5 chondrocytes were cultured in Dulbecco's modified Eagle's medium (GIBCO). Cells were plated in 12-well plates, cultured to 60-80% confluence and transfected with FuGENE 6 (Roche) as previously described (21). Cells were cotransfected with 300ng of MMP13 promoter luciferase reporter and 25 ng of pSV2-beta-gal. 1,25-(OH)2D3 was added as indicated. Cells were incubated for 24 h before harvest. The reporter assays were analyzed with a BD Monolight system (BD Biosciences). Luciferase activity was normalized to β-galactosidase activity. All experiments were repeated a minimum of three times. Data was reported as the mean ± standard deviation (S.D.). Comparisons were made between groups by Student's t test. A p<0.05 was considered as statistically significant. To investigated the effect of 1,25-(OH)2D3 on MMP13 expression, we performed quantitative real-time RT-PCR on RNA of chondrocytes. ATDC5 chondrocytes were treated with different amounts of 1,25-(OH)2D3. RNA was isolated for RT-PCR analysis. Figure 1A showed that 0.1 nM of 1,25-(OH)2D3 was able to activate MMP13 expression by 31.7 fold. Increasing amounts of 1,25-(OH)2D3 led to higher levels of MMP13 expression. 10 nM of 1,25-(OH)2D3 was able to activate MMP13 expression by 364.3 fold, and 100 nM of 1,25-(OH)2D3 was able to activate MMP13 expression by 436.3 fold. This demonstrated that 1,25-(OH)2D3 activated MMP13 expression in a dose-dependent manner. To confirm this observation, another chondrocyte cell line Rat chondrosarcoma (RCS) were used to examine the effect of 1,25-(OH)2D3 on MMP13 expression. Likewise, MMP13 expression was upregulated by 5.2 fold, 8.5 fold, and 12.9 fold respectively in the presence of 1,25-(OH)2D3 with concentrations of 1nM, 10nM and 100nM as shown in Figure 1B. These data indicate that 1,25-(OH)2D3 activates MMP13 expression. Compared with RCS chondrocytes, ATDC5 chondrocytes are much more sensitive to 1,25-(OH)2D3 stimulation. Therefore, we focused on ATDC5 chondrocytes to investigate effect of 1,25-(OH)2D3 on MMP13 expression in the following studies. Next, we examined effect of 1,25-(OH)2D3 on MMP13 expression in different time points. ATDC5 chondrocytes were treated with 10 nM of 1,25-(OH)2D3. Figure 2 showed that 4 hr after 1,25-(OH)2D3 treatment MMP13 expression increased by 36 fold. Longer time of 1,25-(OH)2D3 treatment resulted in higher expression of MMP13 expression with the peak at 24 hr after 1,25-(OH)2D3 treatment, at which MMP13 expression was upregulated by 375.8 fold. At 48 hr after 1,25-(OH)2D3 treatment, MMP13 expression activation was down to 362.4 fold. This demonstrated that 1,25-(OH)2D3 activated MMP13 expression in a time-dependent manner. 1,25-(OH)2D3 activates MMP13 expression in chondrocytes in a dose-dependent manner. Two different chondrocytes were used in these experiments: ATDC5 chondrocyte (A) and RCS chondrocyte (B). Chondrocytes were cultured in DMEM and treated with different amounts of 1,25-(OH)2D3 as indicated for 24 hr. RNA was isolated and measured by quantitative real-time RT-PCR. Level of RNA from control group was normalized to a value of 1. Values are presented as the mean ±S.D. *: A star indicates statistical significance compared to control group. 1,25-(OH)2D3 activates MMP13 expression in a time-dependent manner. ATDC5 chondrocytes were cultured in DMEM and treated with 10 nM of 1,25-(OH)2D3 for different time points as indicated. RNA was isolated and measured by quantitative real-time RT-PCR. Level of RNA from control group was normalized to a value of 1. Values are presented as the mean ±S.D. *: A star indicates statistical significance compared to control group. To explore molecular mechanisms of 1,25-(OH)2D3 effect on MMP13 expression in chondrocytes, we used a loss-of-function approach to explore possible pathways involved. The following selective inhibitors were used: SB203580 is a specific p38 inhibitor in mitogen-activated protein kinase pathway, and SP600125 is a specific inhibitor for JNK kinase pathway. ATDC5 chondrocytes were treated with 10 nM of 1,25-(OH)2D3. Different inhibitors were added in the culture medium as indicated. As shown in Figure 3A, 1,25-(OH)2D3 treatment led to MMP13 expression increase by 316 fold. Addition of 10µM SB203580 almost abolished the increment of MMP13 expression induced by 1,25-(OH)2D3. We observed that 1,25-(OH)2D3-induced MMP13 activation was unchanged by treatment with SP600125 as shown in Figure 3A. These data suggest that 1,25-(OH)2D3-induced MMP13 activation is mediated through the mitogen-activated protein kinase p38 pathway. We then sought to examine 1,25-(OH)2D3 regulation of MMP13 expression in protein level. ATDC5 chondrocytes were treated with 10 nM of 1,25-(OH)2D3 for 24 hr. Protein was isolated and analyzed by western blotting. As shown in upper panel of Figure 3B, 1,25-(OH)2D3 treatment led to an increase of MMP13 expression in protein level, and 1,25-(OH)2D3-induced MMP13 expression increase was inhibited by the specific p38 kinase inhibitor SB203580. To address whether increased MMP13 protein levels by 1,25-(OH)2D3 is in parallel with the phosphorylation of p38 in chondrocytes, we examined p38 phosphorylation after addition of 1,25-(OH)2D3 using antibody against phosphorylated p38. As shown in the middle panel of Figure 3B, 1,25-(OH)2D3 treatment resulted in the phosphorylation of p38, and importantly, the p38 inhibitor SB203580 markedly inhibited both the effects of 1,25-(OH)2D3 on the levels of MMP13 protein and the phosphorylation of p38. Either 1,25-(OH)2D3 group or 1,25-(OH)2D3 plus SB203580 group did not affect the protein expression level of control β-actin as indicated in the lower panel of Figure 3B. These results support the observation that the increase in MMP13 expression caused by 1,25-(OH)2D3 is mediated through the p38 pathway. 1,25-(OH)2D3 activates MMP13 through the mitogen-activated protein kinase p38 pathway. 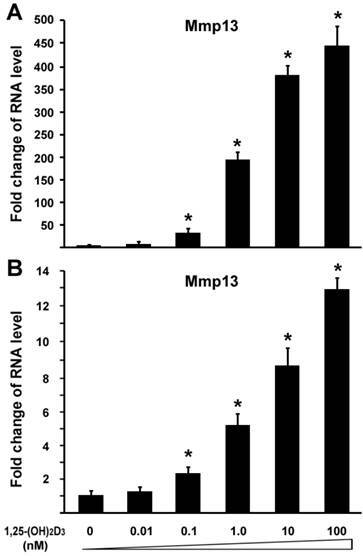 (A) Fold change in RNA levels of MMP13. ATDC5 chondrocytes were cultured in DMEM and treated with 10 nM of 1,25-(OH)2D3 for 24 hr. SB203580 (10 μM) and SP600125 (20 μM) were added to the culture medium 2 hr before 1,25-(OH)2D3 treatment. RNA expression level of MMP13 was determined by quantitative real-time RT-PCR. Level of RNA from control group was normalized to a value of 1. (B) Inhibition by the p38 inhibitor SB203580 of 1,25-(OH)2D3-induced increase in MMP13 protein and phosphorylation of p38 in ATDC5 chondrocytes. Confluent chondrocytes were cultured and incubated with or without SB203580 for 2 hr before addition of 10 nM 1,25-(OH)2D3 for 24 hr. Total cell lysates were prepared and analyzed by Western blot using antibodies that recognize MMP13, phosphor-p38 and β-actin. To determine the direct effect of 1,25-(OH)2D3 on the MMP13 promoter activity, we did subcloning to generate a luciferase reporter construct driven by 1kb MMP13 native promoter. ATDC5 chondrocytes were transiently transfected with the MMP13 promoter-luciferase reporter. 1,25-(OH)2D3 was added as the indicated amount. As shown in Figure 4, the activation of MMP13 promoter reporter by 1,25-(OH)2D3 was detected when 10 nM of 1,25-(OH)2D3 was added. The transfection with 100 nM 1,25-(OH)2D3 resulted in a 3.2-fold increase of MMP13 promoter activity. 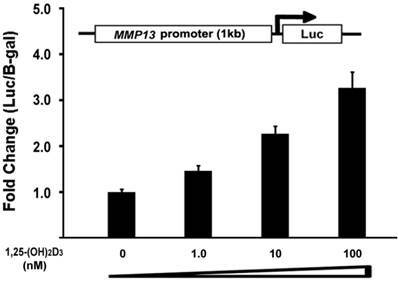 These observations demonstrated that 1,25-(OH)2D3 stimulated 1kb MMP13 promoter luciferase reporter in a dose-dependent manner, supporting that 1,25-(OH)2D3 activated the expression of MMP13 gene. 1,25-(OH)2D3 activates the MMP13 promoter in a dose-dependent manner. ATDC5 chondrocytes were transfected with a 1kb MMP13 promoter-luciferase reporter plasmid without or with increasing amounts of 1,25-(OH)2D3 as indicated. Twenty-four hours post-transfection, cell extracts were prepared and analyzed for luciferase activity. Luciferase activity was normalized by β-galactosidase activity. Values are presented as the mean ±S.D. MMP13 is known to target type II collagen and aggrecan for degradation, two major components of cartilage matrix (4). Our data have shown that 1,25-(OH)2D3 activated the MMP13 expression. It is logic to hypothesize that 1,25-(OH)2D3 may inhibit expression of type II collagen and aggrecan in our current cell conditions. To test this hypothesis, we performed quantitative real-time RT-PCR on RNA of chondrocytes. ATDC5 chondrocytes were treated with 10nM of 1,25-(OH)2D3 for 24 hr. RNA was isolated for RT-PCR analysis. As shown in Figure 5, treatment of 1,25-(OH)2D3 resulted in MMP13 activation by 348.6 fold (Figure 5A), while in the presence of 1,25-(OH)2D3, the expression of type II collagen (Col2a1) was inhibited by 74% (Figure 5B) and the expression of aggrecan (Acan) was inhibited by 73% (Fig. 5C). These data indicated that 1,25-(OH)2D3 inhibits expression of type II collagen and aggrecan while 1,25-(OH)2D3 activates MMP13 expression in ATDC5 chondrocytes. 1,25-(OH)2D3 inhibits expressions of type II collagen and aggrecan while MMP13 was upregulated. ATDC5 chondrocytes were cultured in DMEM and treated with 10nM of 1,25-(OH)2D3 for 24 hr. RNA was isolated and measured by quantitative real-time RT-PCR. RNA expression levels for MMP13 (A), type II collagen (Col2a1) (B), aggrecan (Acan) (C) were analyzed. Level of RNA from control group was normalized to a value of 1. Values are presented as the mean ±S.D. *: A star indicates statistical significance compared to control group. Production of 1,25-(OH)2D3 within synovial fluids of arthritic joints has been known and increase of VDR expression has been found at sites of cartilage erosion in OA (14). The physiological function of 1,25-(OH)2D3 at these sites remains unclear. MMPs are important regulators of tissue remodeling and repair, but MMP overexpression or expression for too long in a joint can cause pathologic manifestations in chronic joint diseases such as OA. Thus, chondrocytes that produce MMPs must employ a multilayered mechanism to keep the production of MMPs under control. MMPs collectively degrade all components of the extracellular matrix and are believed to be involved in progressive cartilage destruction in arthritis. Among the MMPs, enhanced MMP-13 activity has been implicated as playing a central role in cartilage degeneration in OA (22). Here, we report for the first time that 1,25-(OH)2D3 activates MMP13 expression through mitogen-activated protein kinase p38 pathway in chondrocytes. We identified MMP13 as a 1,25-(OH)2D3 regulating target gene. This is supported by our gene expression regulation studies in chondrocytes. ATDC5 chondrocytes had markedly increased MMP13 gene expression after 1,25-(OH)2D3 treatment. Moreover, 1,25-(OH)2D3 activated MMP13 promoter reporter expression transcriptionally. It is also confirmed that 1,25-(OH)2D3 inhibits expressions of type II collagen and aggrecan, two MMP13 downstream targets for degradation in chondrocytes. We have observed in this study that MMP13 mRNA is increased 300-400 fold after 1,25-(OH)2D3 stimulation in Figures 1A, 2 and 3, while MMP13 protein and promoter are only increased a few fold. The possible explanation is as follows. The production of mRNA of the DNA is mediated by transcription. The mRNA level itself is useful for the understanding of gene expression regulation. The relationship between RNA expression level and protein product level is quite complicated. Because of various levels of post-transcriptional and post-translational regulation, the amount of transcript does not always correlate with the amount of protein produced in the end. Therefore, mRNA levels may not always be proportional to protein levels. 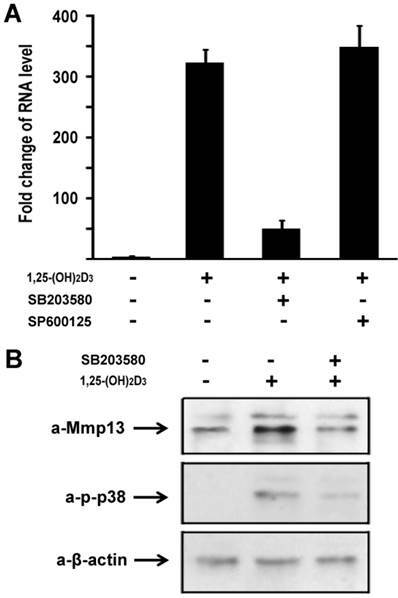 In this study, we further found that the regulation of MMP13 gene transcription by 1,25-(OH)2D3 was almost abolished when the specific p38 inhibitor SB203580 in mitogen-activated protein kinase pathway was added in chondrocyte cultures, thus indicating that 1,25-(OH)2D3 activates MMP13 gene expression through the mitogen-activated protein kinase p38 pathway. However, it does not rule out other possible mechanisms besides p38 pathway through which 1,25-(OH)2D3 controls MMP13 expression, for example, NF-κB pathway or cytokines. In osteoblasts, it has been reported that MMP13 expression is regulated in part by Runx2 (23), a runt-domain transcription factor that plays a pivotal role in the induction of osteoblast differentiation. Runx2-null mice mutants lack MMP-13 expression and do not develop mature osteoblasts (23). Transgenic mice overexpressing Runx2 show enhanced MMP-13 and surprisingly develop osteopenia, perhaps due to osteoclastogenesis being stimulated by increased RANKL (24). Recently, it has been found that MMP13 expression is controlled by Osx directly (20), which is an osteoblast-specific transcription factor required for bone formation and osteoblast differentiation (25, 26). Effect of 1,25-(OH)2D3 on osteoblast differentiation is complex in that 1,25-(OH)2D3 promotes early stages but inhibits late stages of mouse osteoblast development (27). In osteoblasts, the effect of 1,25-(OH)2D3 on MMP13 is cell type-specific: 1,25-(OH)2D3 controlled MMP13 expression in MC3T3 cells, but did not regulate MMP13 expression in either NIH3T3 or C3H10T1/2 cells (28). In this study, we have provided evidence to show that 1,25-(OH)2D3 activates MMP13 expression in ATDC5 chondrocytes. We have also addressed possible mechanisms, and found the mechanism that 1,25-(OH)2D3-regulated MMP13 expression is mediated by mitogen-activated protein kinase p38 pathway. However, the mechanism underlying the cell type specificity of 1,25-(OH)2D3-regulated MMP13 expression remains unclear. One possible explanation is that differentially involved cofactors may be recruited to VDR complexes to coordinate in MMP13 regulation with distinct differentiation states in different cell types. In summary, our data have indicated that 1,25-(OH)2D3 activates MMP13 expression through the mitogen-activated protein kinase p38 pathway in chondrocytes. Since MMP13 plays a major role in cartilage degradation in OA, we speculate that the ability of 1,25-(OH)2D3 to potentiate MMP13 expression might facilitate cartilage erosion at the site of inflammatory arthritis. We recognize that this study is somewhat restricted to the 1,25-(OH)2D3 effect on MMP13 activation in chondrocytes. Although as a prominent well characterized MMP member, MMP13 plays a key role in the pathogenesis of OA, there are many other MMP members in this family, together with plasminogen activators, other proteinases and cytokines, which have not been examined in current chondrocyte conditions. Effect of 1,25-(OH)2D3 on those factors in chondrocytes deserve further investigation in future studies. This work is supported by National Natural Science Foundation of China (Grant Number 81171682) and National Basic Research Program of China (973 Program, No. 2012CB619105). This work is also in part supported by Beijing Municipal Science & Technology Commission (NO. D121100004212002). Corresponding authors: Chi Zhang, Bone Research Laboratory, Texas Scottish Rite Hospital for Children, University of Texas Southwestern Medical Center, Dallas, Texas, USA. Email: Chi5.Zhangedu; and Xuenong Zou, Department of Spine, The First Affiliated Hospital of Sun Yat-sen University, Guangzhou, China, Email: zxnongcom.